Movistar Yamaha MotoGP has decided to postpone their testing plans until tomorrow after rain put action to a halt at the second day of MotoGP testing in Valencia. 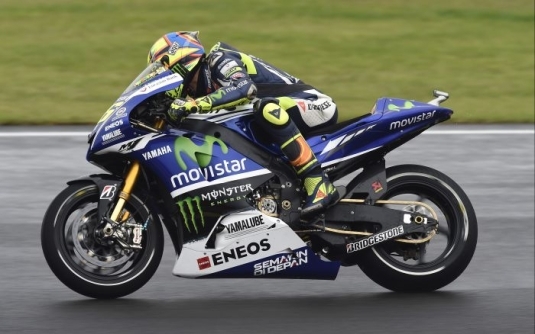 Valentino Rossi was one of only eleven riders who braved the rainy weather at a soaking wet Ricardo Tormo Circuit. The Italian sensibly decided to wait for conditions to get better before mounting his 2014 Yamaha M1, saving the 2015 bike for dry conditions. With two hours and forty minutes of the session remaining, the nine-time World Champion cautiously picked up the pace over his first flying laps. He soon rose to third place, posting a 1’43.813 on his eighth lap. Rossi then had a short stop at the pitbox before heading back out on the track. However, he was only able to complete 13 laps as weather conditions suddenly took a turn for the worse, leading the Movistar Yamaha MotoGP team to decide to resume the testing program tomorrow instead. Monster Yamaha Tech3 riders Pol Espargaro and Bradley Smith opted to not run on the second day of the Valencia test and will wait for tomorrow to return to action with dry weather expected. Pol Espargaro decided against competing in order to give his injured foot time for recovery after the efforts of the weekend in preparation for the final day of testing. Whereas British rider Bradley Smith chose to wait for dry conditions tomorrow to focus on evaluating the important specifications provided by Yamaha, as it will be the last appearance before the Sepang tests in February. The second day of practices at Valencia racetrack was spoiled by the rain. Stefan Bradl preferred not to go on track, postponing the work to the third and last day of testing, while for teammate Loris Baz was the occasion to test a MotoGP bike for the first time on the wet. The Frenchman completed in total 32 laps, setting a lap time of 1.46.143 and finishing in 20th position. Two small crash in the afternoon, without consequences for the rider, didn’t stop Baz to smile. His feeling on the wet with the Forward Yamaha was good and he looks forward to continuing to work tomorrow. Did expect to see Nicky Hayden near the top of this list, I have been thinking he should retire. Melandri is impressive on the new Aprilia. Oops, meant “didn’t” expect Nicky….